Maritzburg United are all set for an historic first ever cup final against Free State Stars in the 2018 Nedbank Cup final on Saturday 19 May (7pm kick off) at the Cape Town Stadium. The two clubs have been amongst the surprise packages of the PSL this season, Fadlu Davids’ Team of Choice having claimed a fourth place finish in the league while Luc Eymael’s Ea Lla Koto ended sixth. Maritzburg started with a 3-1 win over Swallows FC, going on to beat Royal Eagles 2-1 in the last 16 and Bloemfontein Celtic in the quarter-finals by the same score-line. 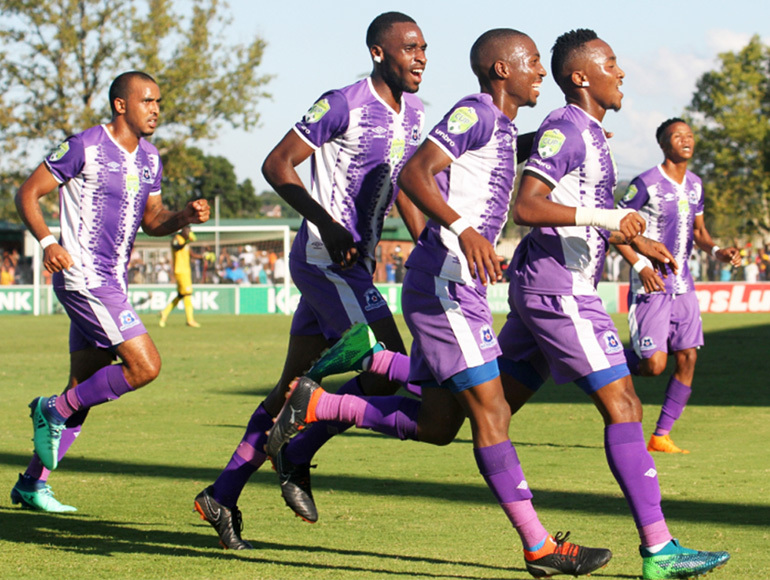 Their biggest test came in the semi-finals against Mamelodi Sundowns and the Team of Choice passed with flying colours, underlining just how far they have come this season by bouncing back from a goal down to win 3-1 against the 2016 African champions. Stars also played two NFD clubs en route to the final – they beat Super Eagles 2-1 and edged out Ubuntu CT on penalties after a 1-1 draw, either side of a 2-1 victory over Chippa United. Their most impressive result was also in the semi-finals, a 2-0 win over Kaizer Chiefs, making it the first time in 15 years that there will not be a Gauteng club in the final. Maritzburg beat Stars 3-0 in Bethlehem in the league in January, but lost 0-1 at the Harry Gwala Stadium in September last year. In the last five meetings, United have won three. Overall though, Ea Lla Koto have eight wins to Maritzburg’s four, with eight draws. Team of Choice and former Ea Lla Koto marksman Andrea Fileccia is the leading scorer in the Nedbank Cup this season with three goals and has been key to the PMB side’s success. Left-back Bokang Thlone started his career at Stars before making his way to Pietermaritzburg via Bidvest Wits. The Free State side have several ex-Maritzburg players in their ranks including Ghana-born striker Mohammed Anas, defender Thamsanqa Teyise and midfielder Nhlanhla Vilakazi. “We have had a fantastic season, a historic season for the club and also with ups and downs. The downs of course are losing your two players and the up is really finishing in the best position in the history of the club, but that now all falls away with the cup final. “It’s a chance to make history, our first cup final as the club. So we have to be calm, none of our players have won a cup before. Siyanda (Xulu) and Bevan (Fransman) have played in final, but lost. So it’s a new experience for the club and players. “We are playing Stars; they have beaten us at Harry Gwala before, they have played in a Cup final before and have more cup pedigree and we are definitely underdogs. “They are really a difficult team to play against, rigid defending and man-marking and of course one of the best counter-attacking teams in the league. You make a mistake in your build-up they punish you. “It will be fantastic to be in the final in my home town. It is always special to play in your home town. Having said that though, the final is the final - even if it was in Upington, I would have been happy to play the final! “Stars have had a good season. They’ve gone about their business quietly, no one has followed them too closely. They are a very good side, they didn’t get to the final by accident.